Brief Description: Learn about DNA, and extract it from bananas, strawberries and kiwi. Cut and clean the bananas, strawberries, and kiwi. It is highly recommend that a trial run of all experiments be done beforehand, to see how best to guide instruction during the program. Discuss DNA. 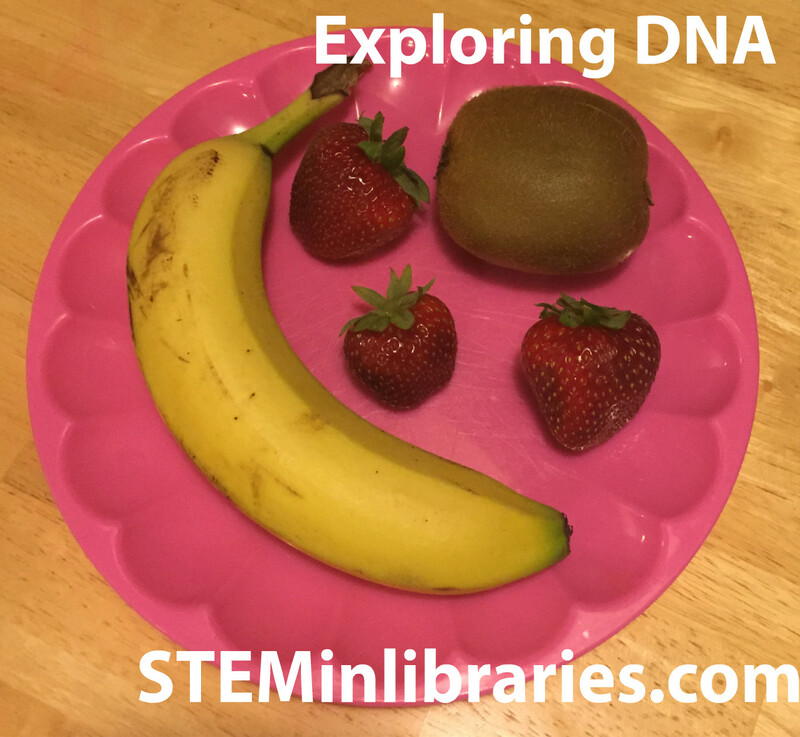 The discussion questions portion of the Microbial Discovery Activity: Extracting DNA from a Banana by the American Society for Microbiology on Asm.org has some simple and concise explanations of what DNA is, and how it can be extracted from various organic objects. For additional information both DNA Details on Chem4kids.com and How to Explain DNA to Kids on Tfscientist.hubpages.com are good sources to consult. Additionally, all links to the experiments offer excellent explanations as to how the procedures work. We followed the instructions outlined on GEMS : Girls Excelling in Math and Science’s Banana DNA Extraction project. Based on a test run of the experiment, we split this experiment in half, doing the experiment up to the portion where the bananas need to be strained with a coffee filter, and moved onto the next experiment. The filtering process took a long time, and moving onto the next experiment conserved time. As a safety precaution, only librarians poured and handled the rubbing alcohol. We primarily followed the instructions onlined on Squishy Science: Extract DNA from Smashed Strawberries A genetically geared activity from Science Buddies on Scientificamerican.com, but also referenced Do-It-Yourself DNA on Sciencebuddies.org. Again, as a safety precaution, only librarians poured and handled the rubbing alcohol. As an extra activity, Squishy Science: Extract DNA from Smashed Strawberries A genetically geared activity from Science Buddies on Scientificamerican.com recommended trying the procedure with kiwis, so we used the same instructions to try pulling DNA from kiwis. As before, only librarians poured and handled the rubbing alcohol. This was an interesting program, one that we found daunting at first glance, but went surprisingly well. The tweens were intrigued and engaged in the process, and carefully followed all the directions. We did the experiments together as a group, one step at a time, but it would be possible to write the experiments up, and have the tweens follow the instructions independently. All the experiments worked fairly well, although we only had moderate success with the bananas, and that caused some aggravation. Also, be sure to use large portions of cheesecloth for straining; the weight of filtering often caused the cheesecloth to fold into itself. This was a complicated experiment and we would not recommend it for an audience younger than fourth grade. This program would work well for teens, especially, if further steps were taken to write out the instructions for the teens to follow on their own, and more organic material to test were on hand.